Baptism In The New Testament In this thorough and well-documented study of the sacrament of Holy Baptism, G.R. Beasley-Murray presents a critical defense of the doctrine of believers' baptism on the basis of the New Testament evidences. The author--one of the leading New Testament scholars in England--is himself a Baptist; but his discussion transcends denominatioal lines. Beasley-Murray begins by discussing various rites that precede Christian baptism historically, and analyzes the relationship between these earlier rites and baptism. From these antecedents--Old Testament ritual washings, Jewish proselyte baptism, the lustrations practiced at Qumran, and the baptism of John the Baptist--the author proceeds to the foundations of Christian baptism in the career of Jesus, its emergence as recorded in the Acts of the Apostles, and its development in the New Testament epistolary literature. 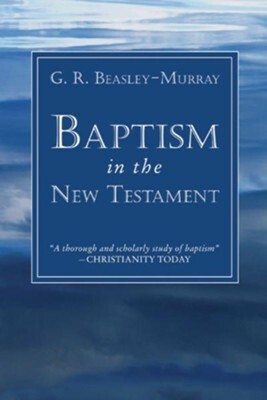 In his consideration of the doctrine of Christian baptism as ariculated in the New Testament, Beasley-Murray focuses his attention on the necessity of baptism and its relationship to grace, faith, the Spirit, the church, ethics, and hope. A careful examination of the rise and significance of infant baptism follows, and the study concludes with a selected bibliography and several indices. Baptism in the New Testament was widely acclaimed in its initial cloth edition. F.F. Bruce has noted that . . . it is a work of first class scholarship, and it would be a tragedy if it were to become unobtainable. Not for armchair theologians only, said the American Lutheran. Preachers will find their homiletical resources greatly enriched as they follow the author's exhaustive but never wearying, exciting but never fanciful, exegetical treatment of the score or more epistle texts that bear upon baptism. And the Mehodist Recorder (England) found this to be a valuable and persuasive work. It is to be hoped that it will be widely read and pondered. G.R. Beasley-Murray was Principal of Spurgeon's College, London. He is author of Jesus and the Future and A Commentary on Mark 13. I'm the author/artist and I want to review Baptism in the New Testament.